Would you like to grow faster with investors around the globe? Negotiations with investors often drag on for a long time. However, when raising money with us you set the schedule, keeping your funding round quick and compact. The clear structure and deadline also help investors to be organized with their investments. Hosting your funding round on Invesdor also enables you to bring many different types of investors into the same round: VC, angel and crowd, all in one round. Why settle for one? Fundraising with us combines money with marketing. First, building international awareness with a large-scale funding campaign is a great way to build visibility in your target markets, much in the same way as in an IPO. Second, when raising money with us you build an engaged group of shareholders. They are a powerful marketing resource, as they recommend your products or services, contribute with their expertise and become more profitable customers. Crowdfunding is a modern way to raise funding online from an expanding network of international investors. We help businesses from all fields and development stages – from technology startups to listed companies in more traditional industries – to raise funding online, efficiently and securely. 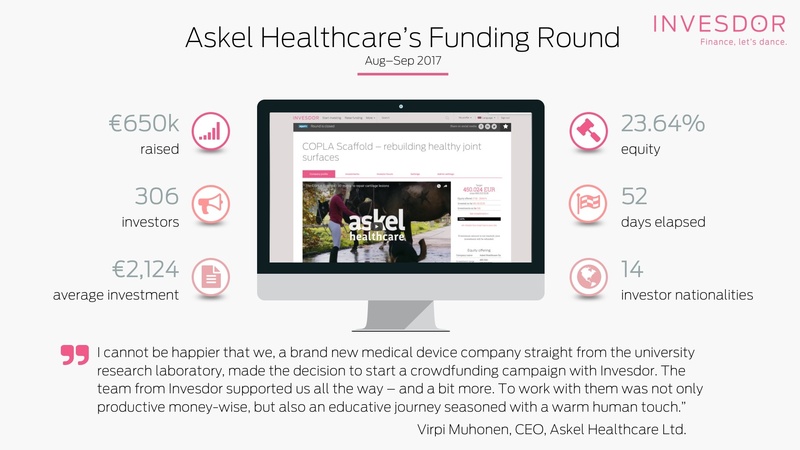 We are the market leader in equity crowdfunding in the Nordics and a strong challenger in the UK. We have been solving the issues of cross-border fundraising since our founding in 2012 and we are proud of our expertise in cross-border offerings. With our licence enabling us to operate in the entire European Economic Area, we are on a mission to help businesses Europe-wide to reach investors from all around the world. We pride ourselves on our full-service approach. The Invesdor team has your back from the preparation of your funding round all the way to its closing. Access our pool of 50,000+ international investors. Hands-on human to human support throughout your campaign. Structure your pitch materials on our easy-to-use platform. Our integrated payment systems make capital transfers quick and flexible. Make paperwork hassle-free with our document templates and helpful legal team. Work on investor outreach and plan your campaign with help from our marketing team. Need extra help? Whether it's marketing magic or legal labour, our team's expertise is yours for an additional fee. Our digital investor relations tools make it easy for companies to have many investors.